← Surprise! Power is early! The actual tour kicks off Saturday and goes through the end of September, possibly into October (if you’d like your blog to be added, please email Jessica at totalbookaholic (at) hotmail (dot) com). Each tour stop will feature a guest post, interview or review of Power, and each will have a giveaway (as blog owners allow). When each post goes up, I’ll post a question here on my blog related to that post. I’ll give instructions on how to answer and each question you answer earns you an entry for the grand prize giveaway at the end. What do you win? I’m taking entries through Friday, October 5th, and will announce the winner the following week. Got excited to see the winning prizes! It’s really very attractive and I’m interested to join the party. Thanks for inform about it and good luck for the crew. Hope it’ll be a gorgeous and most happening tour. 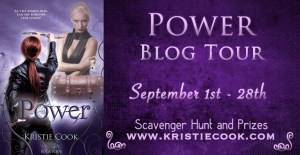 Really enjoyed your Power blog tour! Good luck and happy trails in the coming months :)!